Why is it my friends that so many people today, especially those of higher education, look upon Christianity as a superstition? Why is it they feel that we have outgrown this superstition now? Why is it they can't see anything practical about it? Why is it that the educated people do not seem to believe in the Bible? Let me tell you why, and here is the surprise, it's because they don't know what the Bible says. It's because the Bible has been represented to say exactly the opposite of what it does say and the people have taken for granted that which is popularly believed. Today you hear that if you just accept Christ as personal savior, if you just say you receive Him or confess Him before men that you are saved, that's all there is to it. And they make a superstition of it and nobody seems to know exactly what they mean; it's sort of a sentimentality, it's an emotional something and people seem to just take it blindly or else they regard it as a superstition and they reject it altogether. Oh how we have missed the boat. Oh how we have been deceived. People don't seem to know why they were put here on this earth, they don't know the purpose of life. They don't know the way of salvation, they don't know the way to peace or anything else. And so it is that people don't seem to know what happened. I'll tell you what happened. When Jesus Christ came men rejected His message. And at first they rejected Christ. But the more the world began to martyr the real Christians, the faster Christianity began to grow in the early days. And so finally they said well let's get inside of this thing and so a fifth column movement started and the pagan world began to inject their fifth columnists into a professing Christianity. They joined the church, they professed to be Christians but they brought along with them all of their pagan superstitions, their pagan doctrines. They took the name of Christ; they accepted the prestige of Christ and His name. They worshipped Christ, they extolled Him, they preached about Him but they denied the message that God sent by Him. 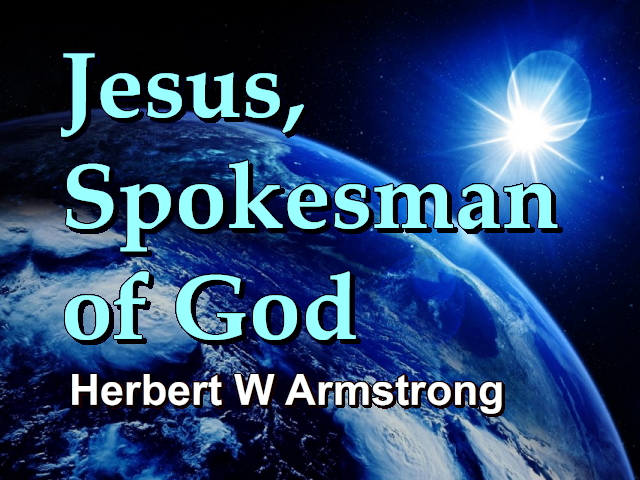 Now Jesus Christ was a messenger and God sent a message to this world by Him and the world rejected that message. And the world as a result has turned even the Bible upside down. And for eighteen and a half centuries the message that Jesus brought, the true Gospel of Jesus Christ, has not been preached to this world. That's just a plain simple fact and if you'll study your Bible to find what that message was, you try to see if you can find it being popularly preached anywhere today. Now will you get your Bible, will you open it and see with astonished eyes what it does say? We're in the seventh chapter of John now, and we'd come up to the twenty-fifth verse and I'm going back to the beginning just for a brief skip-over to show you the ground we covered the past two days. It was the Feast of Tabernacles that was at hand and of course anyone would think that you're crazy if you observe anything like that today, but Jesus did it and the Bible says He came to set us an example that we should follow His steps (I Peter 2:21). Isn't that peculiar, how do you square that with modern teaching? In other words they teach exactly the opposite of the Bible today and there it begins. Jesus was talking to His own brothers; they urged Him to come on up and show openly in Jerusalem the works that He was doing. Now He did works. We're not supposed to follow His steps today according to the popular teaching. We're supposed to do no works, but let me tell you something my friends, you're going to do works, they'll be either good or bad. Which will you choose? If you refuse the good works of Jesus Christ, the good works that come from obedience to God, you will have the bad works of disobedience. There is no middle ground, you'll have one or the other. Well Jesus said to these brothers of His, "...the world cannot hate you" (John 7:7). They were of the world, He was not. He was different from His own flesh brothers, they all had the same mother, they had a different father, they were half-brothers. Jesus' Father was God Almighty in heaven. Their father was Joseph, but they were brothers, half-brothers, they had the same mother. And they were of the world and Jesus was not. And many a family today is divided the same way. Jesus said the world cannot hate you. In another place He said, "...the world loves its own. If you were of the world, He said to His own disciples, then the world would love you because the world will love its own...but He said, because you are not of the world the world hateth you" (John 15:19 paraphrased). Because I am not of the world the world hates me. This world has works and its works are evil and what Jesus Christ came to do was to show us the way into righteous works. Good works, you have works, it's just a case of which kind do you want. The things He taught He did not teach out of His own mind, they were not His own ideas. Most of our listeners know and understand that the prophesies that I give you are not mine, but His that sent me. And I have made it very plain, for instance, going through the book of Revelation that John was not the Revelator, and Herbert W Armstrong is not the revelator and I was not giving you the ideas of the apostle John as a revelator or the ideas of Herbert W Armstrong of this day. I was giving you the interpretation of Jesus Christ. I was giving you the Revelation of Jesus Christ; He is the true Revelator. And the book of Revelation is called in your Bible, the inspired words say; "The Revelation of Jesus Christ;" but the uninspired words that men wrote above it say; "the Revelation of St. John the Divine." Why don't you just open your Bible and look at it for a moment? Turn back to the book of Revelation, the last book in your Bible. Perhaps you never noticed this before. Now the title was written by men; that was not inspired, God didn't write it, men did, look how men pervert everything and disagree with everything God says. Men don't agree with God, men wrote in here; "The Revelation of Saint John the Divine." Now read the very first words of the Book that God inspired and God had this written: "The Revelation of Jesus Christ, which God gave to him..." (Revelation 1:1). Now which will you believe. There it is, do you see it with your own eyes in your own Bible? Do you see that men do not preach what the Bible says? But men who have written these things and have even have tried to pollute and to malign and to change and pervert the very Bible itself; the way they have even written titles and subtitles and things of that sort in it. And here Jesus said that my teaching or my doctrine is not mine but His that sent me, and the Father sent Him. There again it's the revelation of God who sent Him gave Him and He's preached what His Father said. You know, Jesus said again: "...of myself I can do nothing" (John 8:28 paraphrased). Well if Jesus Christ said, of myself I can do nothing, and if He had to rely wholly on God the Father, and He was Jesus the Son of God, He was the Messiah and He could do nothing of Himself, He was helpless humanly, how much more helpless are you and I? And yet the people in this world think they don't need God, they can get along alright, they don't need Him. They think of themselves they can do everything, and they're setting out trying to do it. And then they wake up — they don't wake up — but they look at all these headaches they have and all of these heartaches, and they notice all of the fears and the worries that they have, and they're terribly unhappy and their lives are empty, and life is a burden and they just have to try to fill up time by finding pastimes to pass away the time. In other words they're not using themselves for any purpose that they were put here for, just passing away time until the time comes to die. And then if death is approaching them and they know a time is coming when they are going to die, then they're frantic and they want to go on living. And when they go on living they try to just pass away and waste the time. You know it isn't very consistent, why don't we stop to think once in a while what kind of people we are anyhow. If you would read and understand the Bible the message that came from God; the message that God sent by Jesus Christ you'd find the truth and the true answer and there is the only place in all this world you're ever going to find any real happiness. It's the only place you'll find any real understanding, it isn't a superstition, its real understanding, and it's the only place you'll find the way to peace and the way to a happy abundant life. Well my friends, if Jesus could do nothing of Himself, neither can I and neither can you. And if He needed the Father who sent Him and had to rely on God Almighty and the great power of the Creator how much more do you and I need to rely on that same power? I would be afraid to live another moment of my life without the protection and the guidance of God Almighty. I have to seek it all the time every day. I know that, well, God has permitted circumstances to come about in my life that I don't dare get away from God. It just seems that things will begin to go wrong instantly and I have to rely on Him constantly. And then again there are so many of you out there all over this United States and others now all over the world, who write in and who begin to depend somewhat on my prayers, and I have to pray for you too. And you don't know how much I have to pray for my own self, my own family. This work that God has entrusted to us into which He has plunged us; and in which He is using us; and I need your prayers for myself and for this work too. Well, that's according to the teaching of Jesus and the teaching of the Bible that we should pray for one another. And I think we neglect that a great deal; we don't do it like we should. And the very last chapter in the Bible, way over here in Revelation, you'll find that the passport into the kingdom of God is doing the Father's commandments; because you read in verse 13, the last chapter in all your Bible, the very last page probably of your Bible, verse 13; "I am Alpha and Omega, the beginning and the end, the first and the last" (Revelation 22:13). That's Jesus Christ speaking. Now I know people that try to say there is a competition between God the Father and Jesus Christ; apparently they believe it because they say well we'll keep the commandments of Christ but we won't keep the commandments of God. And the reason for that is that they believe it was God the Father who spoke to Israel in Mt. Sinai as you find recorded in Exodus 20 who said; "I am the [Eternal] thy God, that brought thee out of the land of Egypt" (Exodus 20:2 paraphrased), and that gave them the Ten Commandments. Now actually, that was the One who was the Spokesman of God, the Logos, who was made flesh and dwelt among us who was Jesus Christ (John 1:1). He is the Word and He is the One who did the speaking at Mt. Sinai; and He is the One by whom God created the Earth, and He is the Eternal who created it in the six days. But nevertheless, the law originated from the Father and not from Christ; but Christ spoke His Father's Word. And He said; "I have not spoken anything of myself" (John 8:28). But some preachers today believe He did. They think His Father said "keep the Sabbath day," but Jesus said, "No, keep Sunday." Well you can't find it in any place in the Bible. I don't know why people try to make you think the Bible says that but it doesn't. You know I've even heard some preachers quote the passage, "to forsake not the assembling of yourselves together on the first day of the week." Now that is not in your Bible at all; there isn't any first day of the week there. But some people read it in there and try to mutilate and malign and twist and pervert the Bible to put their ideas in and make people get their ideas. You know it reminds me of some people that realize that there are many, many millions of people listening to this program and they try to get their ideas over to me so that I will preach their ideas to the millions of people, and they think if they can only get them to me that then that's their way of reaching the millions who listen to me on the air. And a lot of people know that, well, people read the Bible and if I can get my idea in the Bible I'm going to get it across to the people. We'd better just get out of the way and let God's Word go by. Jesus said he that speaketh of himself seeketh his own glory and that's what a good many are doing today. But he that seeketh His glory that sent Him; which Jesus did, the Father's; the same is true and no unrighteousness is in Him. Now, the people then later said in verse twenty; "Thou hast a demon (devil): who goes about to kill you" (John 7:20 paraphrased)? He said the people try to kill Him and they said, "Well now, who's trying to kill you?" Well, all of their church leaders were, but the people now denied it of course, there isn't any truth or honesty in them. Yes Jesus was working the works of God; He was here doing God's work. Well now continuing in verse 25: "Then said some of them of Jerusalem, Is not this he, whom they seek to kill [now they knew that the leaders were trying to kill Him; they were seeking to kill Him alright]? But, lo, he speaketh boldly" (John 7:25). He was speaking boldly at this great Festival where the people came from many nations all around; proselytes who had accepted the religion of Judaism which was not the religion that was given to Moses; but a perversion of that, that had come among the Jewish people. And there were many Gentiles who had accepted it and become proselytes, as they were called, to the Jewish religion of the time called Judaism which was a degeneration of the religion of the Old Testament under Moses. They wondered, well, now why are they not taking Him? He's speaking here boldly and He's the One they were trying to find to kill. Well He gives the answer Himself a little later over here in the thirtieth verse; His hour, or His time had not yet come; that's why they couldn't take Him. But now the people began to wonder, I wonder if these rulers do know after all that He is the very Christ, or the very Messiah? And they were probably using the more Hebrew or Jewish word Messiah instead of the more Gentile word Christ. Always He magnified His Father as greater than He. And always here is the family relationship. God is a kingdom my friends, and it is a family grown into a great kingdom; it is a family, and it is a family where the Father is the Head. And the Father does the governing and sets the laws. It is the creating family, it is the supreme ruling family of the universe and the Father is the head Ruler. I guess not very many people know that. Most people think of God as one Person. But God is an Elohim. Elohim is the word used in Genesis one verse one in the beginning of your Bible. "In the beginning God [or Elohim]"(Genesis 1:1), and that means more than one person. And God didn't say let me make man in my image; but God said. "Let us make man in our image" (Genesis 1:26). And Jesus Christ was God, He looked like God. He said, "...if you've seen me you've seen the Father" (John 14:9 paraphrased). But He also looked like other men and here are other men here saying; well we know all about Him, we know where He came from, He's just like any other human being, how could He be the Messiah? How could He be God? My friends, God had designed in the very plan of God; working out His purpose here below that Jesus was to give His life for the sins of the world. Jesus had offered His life voluntarily, it was for the purpose of death that He came into the world and was made flesh like you and me. He was tempted in all points like you and I; He was human as we are. And it was for the purpose of tasting death for every man. But God does things on time, God is punctual and God had set a time for Jesus to give His life. God has set a time for the Second Coming of Christ but no man knows that day or hour except the Father Himself. Now God had set a time, and that time had not yet come and men couldn't lay hands on Him. This is the supernatural doing of God; the men didn't understand why. But there's the answer; because His hour was not yet come. God is the Supreme Ruler. God is determining these things. Now if He is not the Messiah, even could the real Messiah do any more miracles than you've seen this man doing? The people were astonished, but they were also astonished at His doctrine just as you are when you hear the same doctrine today. Now they thought they'd take Him but they were still trying to get ahead of God — this was the Feast of Tabernacles time and Jesus was the Passover Lamb of God that taketh away the sin of the world and He was going to be killed at the Passover time and killed on the Passover day; the same day that the lamb was always killed. Now God knew that and that time hadn't come, it was six months away. People think they can go there up to heaven. Today they teach you, well sure we can go to heaven, anybody goes to heaven if they're saved when they die; if they've got the password and profess the name of Christ. That's an empty belief my friends; there isn't any truth in it and you can't find it in the Bible. Jesus said: "...no man has ascended up to heaven, but he that came down from Heaven even the Son of man…" (John 3:13 paraphrased). He Himself. Now continue verse 35: "Then said the Jews among themselves, whither will he go, that we shall not find him? Will he go unto the dispersed among the Gentiles" (John 7:35)? Will He go unto the dispersed among the Gentiles; you understand that language? Most of you don't. Now the ten tribes were known as the 'dispersed among the Gentiles.' Most of you don't seem to know that the children of Israel consisted totally of twelve tribes. And they were divided into two different nations from the time of Rehoboam, the son of Solomon, the grandson of David, the king of Israel. And the ten tribes had rejected Rehoboam from being their king and instead of taking the king God gave them, the dynasty that God had set, they elected a king of their own choosing. Just as men have been trying to do ever since on earth; well, in fact men have always tried to do it, they want to choose their own rulers. They want to play politics; they want to do it the way men want it. And so they chose Jeroboam for their king. But Judah split off from the nation Israel and formed a separate nation in order to keep the king that God had given them; and to keep the capital at Jerusalem, Palestine. And the tribe of Benjamin and also the tribe of Levi went with them because the new king, Jeroboam, rejected God's priests and set up his own priests. God had chosen the tribe of Levi to be the priests but men won't have God's ways. They rejected the way of God and so we have those three tribes forming the kingdom of Judah. Now you say but weren't there twelve tribes and three tribes plus the ten tribes makes thirteen, that's true. But you see Joseph had a double portion and Joseph was divided into two tribes, Ephraim and Manasseh, and so that left ten tribes in Israel. And their capital was the city of Samaria. Now the ten tribes, known as the kingdom of Israel, the house of Israel, were not Jewish people at all. They were not called Jews, they had never been Jews. Jew is a nickname from the tribal name Judah and it applies only to the Kingdom of Judah, the tribe of Judah, the tribe of Benjamin [Paul was of Benjamin and he called himself a Jew] and the tribe of Levi. They were lost and if He went there they knew they were not supposed to know where they were and they would never find Him. But today the truth has come and today is the time and the day of the end, the time of the end when God has opened that knowledge and we can know. Well the people were astonished. Well there we are, oh I'm coming to the most interesting part of all and I have to break off there, we'll take it up in the next program.